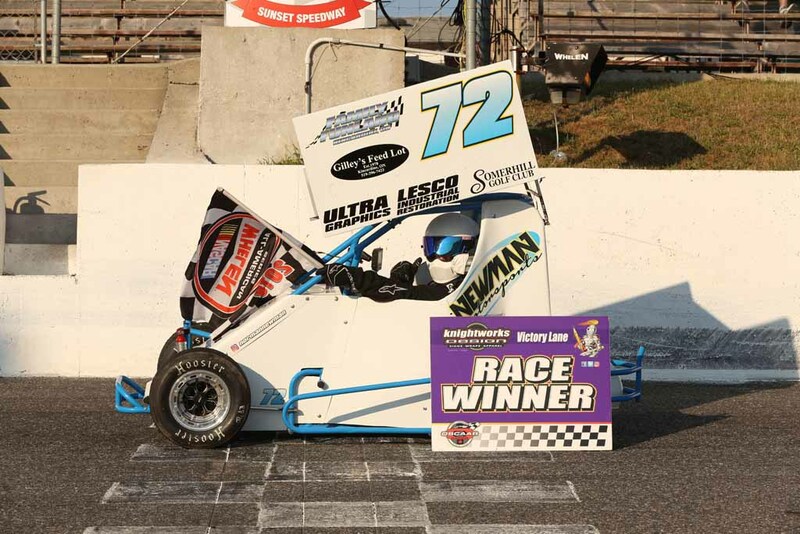 Daniel Hawn snagged his second straight OSCAAR Pro Sprint Sunset Speedway victory on Sunday, but it wasn’t easy for him to do so. 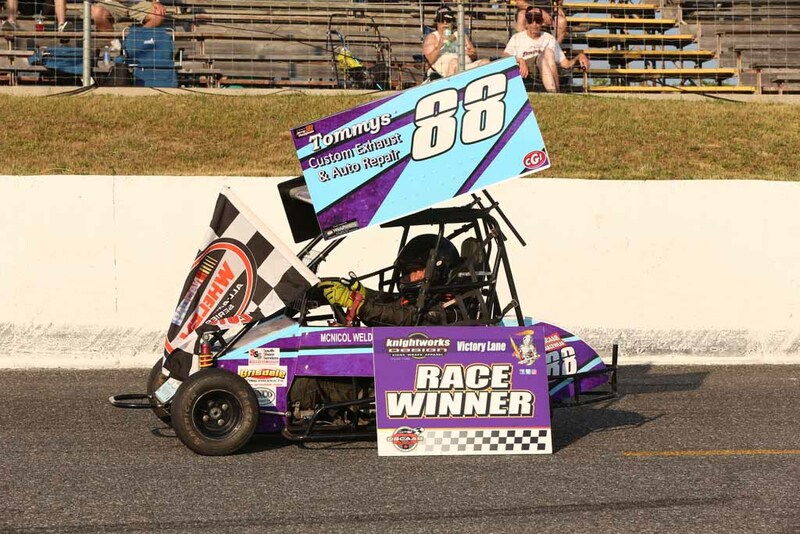 Kenny McNicol won the first heat ahead of Kevin Taylor, Gary Triska, Shawn Stanley, Rob Summers, and James Stanley. 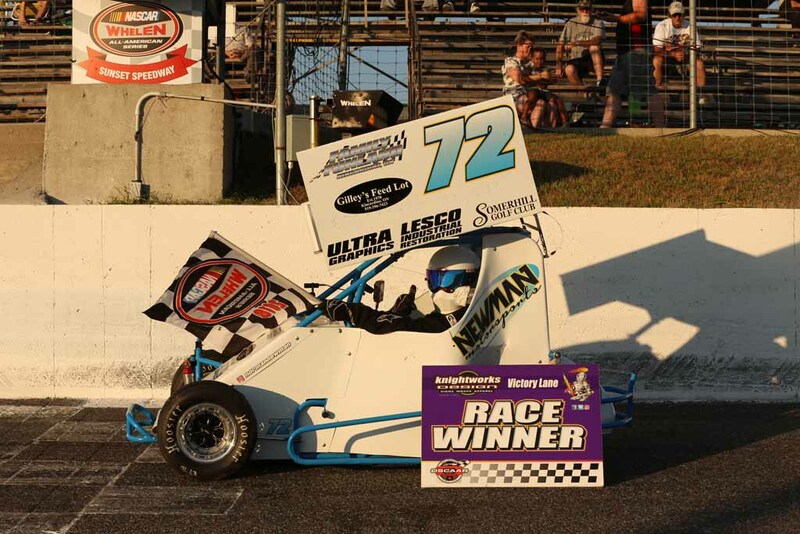 Norman Newman won the second heat ahead of Ryan Battilana, Jayden Riddel, Darryl Anthony, and Mike Westwood. Daniel Hawn won the third heat ahead of Sophie Horton, Tyler Cullen, and Parker Bowman. Norman Newman went for the daily double ahead of Summers and Shawn Stanley. Hawn went for the daily double as Riddel and Battilana spun around coming to the checkered flag following contact. The final heat didn’t start off smoothly as Horton made contact with James Stanley, causing him to spin and make significant contact with the outside turn one wall. Horton would come back to score the victory, but due to jumping the initial start she was docked two spots at the checkered. That would hand the win over to Tyler Cullen ahead of McNicol, Horton, Taylor, and Bowman. 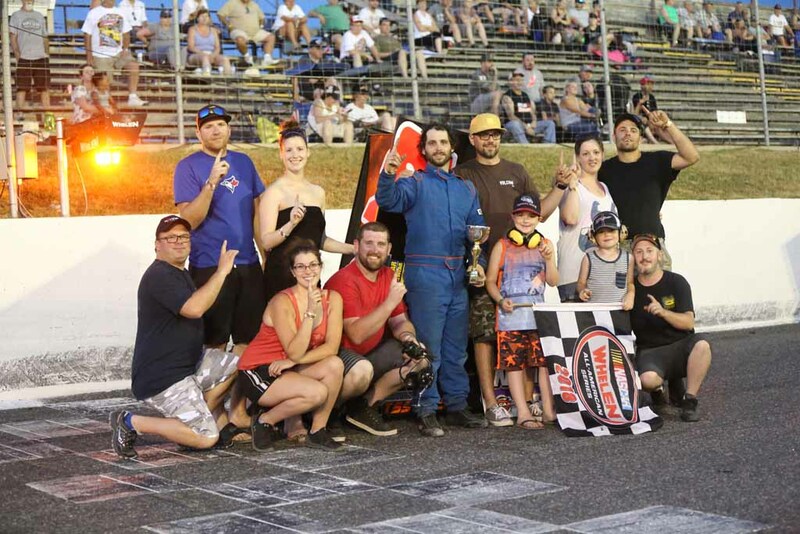 Come feature time, Tyler Cullen started pole ahead of Jayden Riddel, Sophie Horton, Norman Newman, Ryan Battilana, Daniel Hawn, Rob Summers, Shawn Stanley, Gary Triska, Darryl Anthony, Kevin Taylor, Parker Bowman, Kenny McNicol, and Raymond Anthony. The race started off with Cullen and Riddel side-by-side for the lead, with Cullen grabbing the early advantage on Lap 2 as Horton got alongside Riddel for second. Riddel would get back alongside Cullen for the lead, though, taking the top spot on Lap 4. With Riddel out in front, Hawn moved into second a lap later ahead of Cullen, Horton, Newman, Battilana, Summers, McNicol, Triska, Taylor, and Stanley. Hawn would catch up to Riddel for the lead quickly, getting alongside at the 11th lap. The problem was they also found themselves knee-deep in lap traffic behind Taylor and Triska. This didn’t work out, as contact ensued, sending both Riddel and Hawn around in turn one. This handed Cullen the lead for the restart ahead of Norman, Horton, Battilana, Stanley, Summers, McNicol, Riddel, Hawn, Taylor, and Triska. Horton got a good restart to snag the lead ahead of Cullen and Newman. Newman would get alongside Cullen for second, just as the caution came out on lap 12 for Riddel going around in turn two. Just as the caution came out, McNicol headed down pit road with a problem. With 13 laps to go, Horton led Cullen, Newman, Battilana, Summers, Hawn, Stanley, Riddel, Taylor, and Triska. Horton got a good restart to keep the lead as Newman moved into second ahead of Cullen, Hawn, Battilana, and Summers. Hawn continued to move back towards the front, passing Cullen for third with 11 laps to go. Newman would then get alongside Horton for the top spot a lap later, taking the lead on Lap 16 as Triska headed into the infield, done for the event. Horton now ran second ahead of Hawn, Cullen, Battilana, Riddel, Summers, Stanley, and Taylor. Riddel continued his climb back forward, passing Battilana for fifth at Lap 20. However, that run back to the front hit a snag when he went around for the spin in turn two with two laps to go for the third caution. 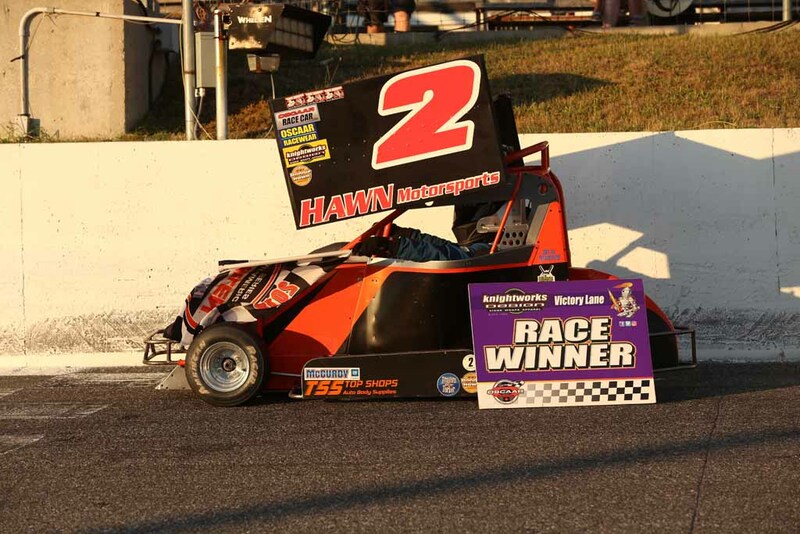 Daniel Hawn would get the impressive restart, going third to first to score the victory. Sophie Horton finished second for her second straight podium ahead of Norman Newman, Ryan Battilana, Jayden Riddel, Tyler Cullen, Rob Summers, Kevin Taylor, Shawn Stanley, Gary Triska, Kenny McNicol. Both Anthony brothers and Bowman also failed to finish, too. 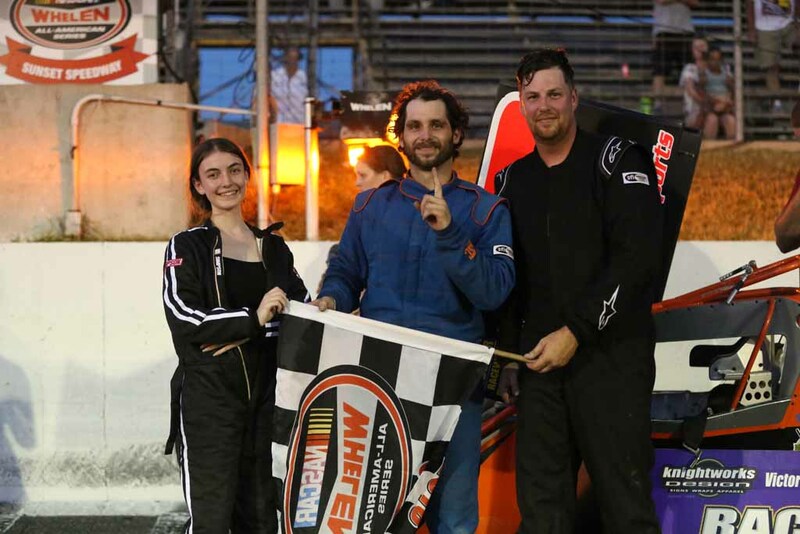 Notably, James Stanley and Mike Westwood both failed to start the feature after their heat problems, and Brody Rickwood broke in practice, causing him to miss the event. 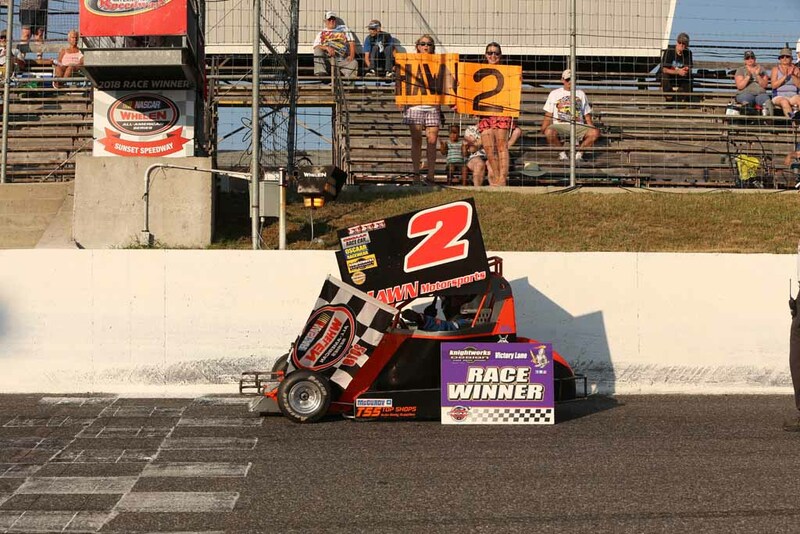 The OSCAAR Pro Sprints will be racing at Flamboro Speedway on Saturday, July 29 alongside the OSCAAR Modifieds. 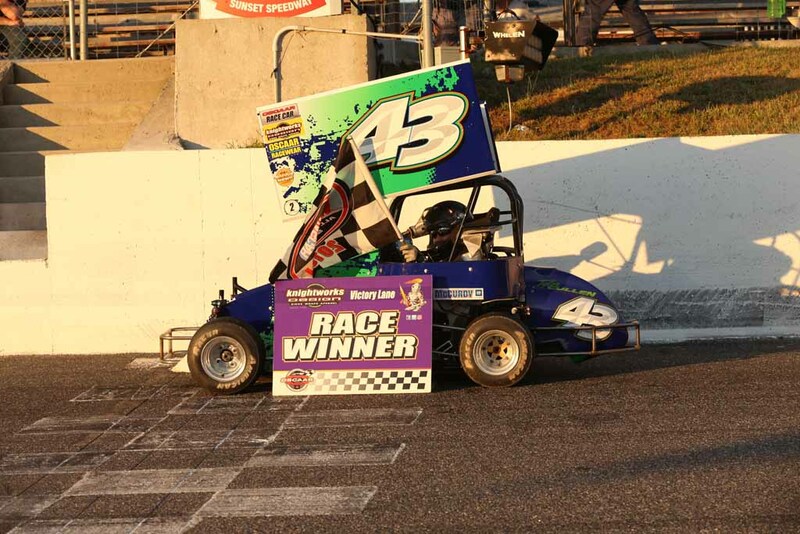 Full details can be found at http://www.flamborospeedway.ca.